The purpose of the Liberia Project 2010 is to build a church and school for the community in Zorzor, Liberia in order to provide the people with opportunities for growth and education in a variety of areas. The birth of our daughter delayed our plans to return in the summer 2012 - the next phase of the project is to build a separate school and playground. However, we are going back! In July 2008, I was in Liberia, where I was born and grew up. The purpose of my trip was to visit my grandmother, who was 102 years old. After a visit to Monrovia (the capital) and then to my grandmother's home in Zorzor (the rural interior), I returned committed to actively doing something to help a group of people I met in Zorzor. My grandmother and I visited a local church that had about 25 members, including women and children. The members of that congregation had services in a one-room, stick and mud hut that was rented for less the $20 a month, which they could not continue to afford. They shared with me that they have been seeking help to purchase an acre of land for $500 and begin building a hut of their own, but have received no help. When I returned to the United States, I raised $500 by doing a hundred-mile bike ride and sent the money to Liberia in October of 2009. The land has been purchased and we will begin the next phase of the project - building a church and school, which is what the community has said they need. 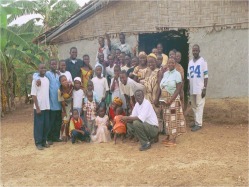 The goal is to raise $10,000 and travel to Liberia in June 2010 to join the Zorzor community in doing the work. 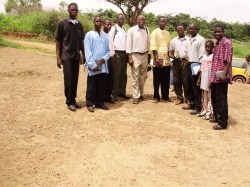 The actual site of the project is Zorzor, Lofa County, which is located in the northern part of Liberia. Though this is about 120 miles from the capital, Monrovia, the trip by vehicle could take about six hours.